Will Bishop Baraga become Venerable? This coming February 6th and 7th will be two of the most important days in the history of the Marquette Diocese. 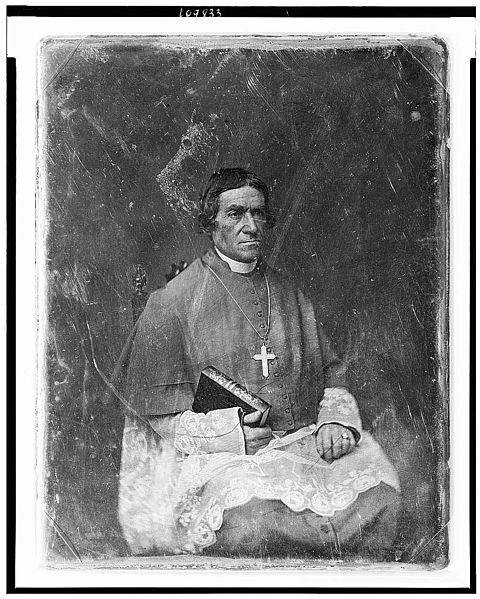 For years, efforts have been made to achieve the canonization of Bishop Frederic Baraga, affectionately known as “the Snowshoe Priest,” as a saint of the Catholic Church. The Cause for Baraga’s sainthood, which the diocese has been supporting for more than half a century, may or may not make significant progress on February 7th. On that date, the Cardinal members of the Congregation for the Causes of Saints will hold a formal discussion of Bishop Baraga’s heroic virtue, conduct a vote, and make their recommendation to the Holy Father regarding whether Bishop Baraga truly exhibited heroic virtue in his life and is therefore worthy of the title of “Venerable.” If the vote is positive, public veneration of him may take place, and his earthly remains, now in the bishops’ tomb in St. Peter’s Cathedral will be moved to a more prominent location for veneration of the faithful. Current bishop of the diocese, Alexander Sample, has designated February 6th as a day of prayer and penance for the success of this effort. If Bishop Baraga does receive the title of Venerable, the next step toward canonization will be for him to be beatified and granted the title “Blessed.” Part of the requirement to achieve “Blessed” status is proof of a miracle, which can occur through the intercession of the prospective saint through the power of prayer. An alleged miracle has occurred and a formal diocesan investigation occurred in July 2010. The Church is currently waiting to have the miracle recognized by the Congregation for Causes of Saints. Once Baraga is beatified, the next step would finally be canonization. While we await the Vatican’s decision, the people of Upper Michigan already know that Bishop Baraga was a man of God who served the Native Americans and early settlers of Upper Michigan for three decades, snowshoeing and walking across the entire Upper Peninsula, as well as Wisconsin, Northern Minnesota, and Lower Michigan. His impact and his memory will never be forgotten here. Molly entered the somber cathedral, now completed and functioning for two years. She clutched Kathy to her, glad to be inside the warmth of the church lit by candles to dispel the gloom of the blizzard raging outside. She felt privileged to attend the saintly bishop’s funeral mass, and when she saw his coffin, she replayed in her mind the day of her miracle, the day she was convinced Baraga was a living saint. It had happened a few months earlier, not long after Kathy’s birth had relieved some of the pain of Fritz’s loss. Molly had found it hard to understand why God had taken Fritz from her, but He had sent her someone equally precious in her long awaited little girl. Then one cold autumn day, Kathy had contracted pneumonia, and Molly was terrified. That day was the worst in her relationship with God; she had never dared be angry with Him before. But even in her anger, she struggled to keep her faith and pray. That same evening Kathy’s pneumonia had turned into a dangerous fever. Although Molly could scarcely afford the expense, she had sent Karl for the doctor. Kathy’s fever raged for two seemingly endless days. Finally, the doctor had admitted Molly should send for the priest to give last rites. But Molly had adamantly refused; she would not give up hope. And then, the thought of the priest had made her think of the bishop. Ignoring the doctor’s protests, she had quickly bundled Kathy up in a blanket, then run through an October rainstorm to the church rectory. When the housekeeper opened the door, Molly demanded to see the bishop; the housekeeper replied he was in a meeting with the Ursuline nuns who had recently started a Catholic school in Marquette; could Molly possibly return in the afternoon? “No, I can’t. It might be too late then,” Molly had cried. “I cannot disturb His Excellency,” said the overly dutiful housekeeper. Molly sobbed as she spoke, and the housekeeper had pitied her, but she also feared Molly’s cries would disturb the bishop. But His Excellency had heard the disturbance and stepped out to the doorway. “What’s the matter?” he had asked, although he need not have; he clearly saw a wretched mother clutching the child she loved better than herself. “Your Excellency, I tried to tell her to come back later,” the housekeeper had apologized, but the Lord’s servant calmly dismissed her with a wave of his hand. “Molly, your little girl is ill,” Bishop Baraga had said. Molly had never spoken to His Excellency before, save a few times when he gave her communion at Mass. She had not realized he knew her name. Overcome with fear, she heard herself babbling in desperation. The words had scarcely left her mouth before Baraga had taken Kathy in his arms. He had then spoken several sentences in Latin. Molly had not understood the words, but she was comforted merely by his gentle voice, his kindness, and the sacred language. Molly had then felt a bit let down, even as the bishop placed the child back into her arms and made the sign of the cross over her. She had muttered, “Thank you” and turned to leave. Then Kathy had let out a cry. Molly had scarcely heard these prophetic words; she had only had eyes then for her child. “Thank you,” she had repeated. “Very good,” the bishop had replied and bowed to dismiss her. She had rushed home to share the miraculous news with Karl. She found him seated with the doctor, both still surprised by her hasty, unexplained departure. “The fever broke!” she told them. “It’s a miracle,” Molly had said. “It was a miracle,” Molly repeated. It had been a miracle. Molly refused to believe otherwise. Now months later, she knelt in a pew waiting for Bishop Baraga’s funeral to begin. She wondered why God had not prolonged his servant’s life longer, that more souls might come to Him. Then Molly remembered the Bishop’s words that many might come to the faith through Kathy. Perhaps Bishop Baraga had served his purpose on earth and now was rewarded, and it was left to those, like her, whose lives he had touched to win souls for the Church. The other day I came across the following paper that I wrote for an eighteenth century literature course when I was a graduate student at Western Michigan University. It was a fun little assignment where we were asked to write a parody of Laurence Sterne’s novel Tristram Shandy (1759-1767). For what it’s worth, here is my offering which has a bit of a Marquette connection since it references my ancestors. This work is intended to be the history of my life and opinions, yet as I sit here typing, I find that my stomach is so upset I cannot concentrate on my subject, but perhaps this is not amiss, as stomach disorders have been my lifelong problem. In fact, I probably had stomach troubles while still in my mother’s womb, so my life story cannot be told without discussing my stomach. My stomach has always caused me grief. No matter what I eat, my stomach becomes upset. Similarly, if I do not eat, my stomach is upset. A doctor would suggest that I change my diet to remedy this problem, but since everything upsets my stomach, changing my eating patterns is hardly a solution. Nor is it a matter of nerves or stress which causes my disorder. As an innocent, sheltered infant, I was removed from all forms of stress, yet I went through more diapers as a result of diarrhea than is suffered by anyone who regularly eats three meals a day at Taco Bell. The reader may then ask if it is not purely my imagination that makes my stomach upset. Reader, I am not like Joyce’s Leopold Bloom, receiving pleasure from my bodily functions, enjoying each chance to urinate, and indulging in the movement of my bowels. The fact is that I have a stomach problem, and there is no solution to my problem; nor is it simply my problem; it is a family complaint. Would that my problem were only my nose! Then, like the admirable Walter Shandy, I could find some consolation in Slawkenbergius. But if there is a worthy book on stomachs, I have yet to find it. Perhaps the lack of such a treatise is why I dwell on the subject now. Perhaps it will behoove the world if I write on the cause of my stomach complaints. Perhaps others like me will realize they are not alone, and possibly, they will even learn the source of their own complaints. But perhaps if I am to write such a treatise, I must first relate how I discovered the true cause of my stomach’s malfunctions. One day, while in the midst of great gastronomical pain, I thought I would contemplate the enigma of my stomach. In my contemplations, I recalled my mother once saying to me, “You have a stomach just like mine.” Therefore, reason led me to theorize that my stomach was a genetic inheritance from my mother; further contemplation caused me to believe my theory was true, for the similarity in our stomachs is attested to by our fighting over who gets to use the bathroom first after a visit to Bonanza’s salad bar. After contemplating the inheritance of my stomach from my mother, I inquired of her if she might have inherited her stomach from one of her parents. She contemplated my question and then recalled that her father had also had a weak stomach. Being an amateur genealogist, I knew my grandfather had had parents of his own; perhaps from one of these parents, he had inherited his disordered stomach. But upon inquiring of other family members, I learned that the memory of my great-grandparents’ stomachs had disappeared into oblivion. But I was determined not to give up the search for my stomach’s origins. It then occurred to me that some information might be derived from “The History of the Bishop and White Families” which Jean Martel, my second cousin once removed, had compiled. This family document was easily attainable since the author had given me a copy. In perusing this work, I learned that my grandfather’s father’s father, Jerome Nehemiah White, was a corporal in the Civil War. 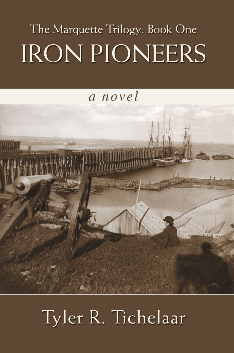 But what does the Civil War have to do with my stomach the reader asks? Well, reader, be patient rather than trying to rush me, and I will let you know. Corporal White fought on the side of the North during the Civil War. Most importantly for my theory, he was shot in the abdomen on June 19, 1864 at Petersburg, Virginia. Following this wound, he did not die, or else I would not be able to write this now, nor would you be able to read this, so be thankful that Johny Reb was such a poor shot, unless of course, you are not enjoying my discussion of inherited stomachs and wish my great-great-grandfather had been shot to death, but I am sure such a brutal thought never crossed my humane reader’s mind. See, I knew you were deeply interested in the state of my stomach all along. But what happened to Corporal White? Well, reader, he went to a hospital in Washington D.C. and recovered. In fact, he was released soon after the Civil War ended. Feeling much better, and wanting to celebrate both his recovery and the end of the war he had so bravely fought in, he decided to see a little of his nation’s capital before returning to his Michigan farm. After all, he was only twenty-four, and since he had seen little of the world he was in little hurry to return home. So one night, Corporal White went to the Ford Theatre to see the play Our American Cousin. But reader, you are anticipating me. Yes, you have guessed my family’s secret claim to greatness. My ancestor, Jerome Nehemiah White, witnessed the assassination of President Abraham Lincoln by John Wilkes Booth. There you have rung from me the surprise I intended for a future chapter since this chapter was only meant to explore the history of my stomach, or actually my birth, but since I am off the topic, let me discuss how this digression relates to the main topic. Reader, I am a firm believer in cellular memory. I believe parents pass their memories on to their children through their brain cells, but only those memories of things that happened in their lives up to the time their children are conceived. My great-great-grandfather returned to Michigan and assisted his wife in conceiving my great-grandfather; in doing so, Corporal White passed on the memory of his wounded abdomen to my great-grandfather’s subconscious, causing all of Corporal White’s descendants to have upset stomachs. Therefore, my stomach is a direct descendant of the Civil War, as the following stomach chart illustrates. Reader, I intended to write about my birth in this chapter. I keep trying to return to my topic, but you keep demanding other information from me. But perhaps these digressions are not without value. Certainly, a little family background is needed to understand how I became the person I am. Really, going back 107 years into my family history is only a small leap, considering I have traced my family tree back nearly two thousand years, and my cellular memory goes back nearly as far. For example, I often have dreams of being in Hastings, England during a great battle. Such dreams might strike you as odd, but since Corporal White was descended from both William the Conqueror and Harold Godwinson, who fought each other at the Battle of Hastings in 1066, my dreams are also the result of a cellular memory passed down for twenty-six generations. Cellular memory is so marvelous it now enables me to begin the history of my life, or my memories anyway, in the year 1066. But I shall not begin this history until the next chapter, having already filled up enough of this one. In fact, my story should rightfully begin in Chapter One, so I will name this section The Preface. And now, on to the Battle of Hastings. As we experience another winter storm today, I thought I’d post another winter scene from The Marquette Trilogy. This scene takes place in Iron Pioneers January 1884 when Agnes Whitman takes her children sledding on Ridge Street. Enjoy! There was no absence of snow that January, and it was the best kind of snow—good for both sledding and snowshoeing. Agnes had already been out with the Marquette women’s snowshoeing club a few times that winter, but somehow she had always been too busy to go sledding with her girls. A fresh snow had fallen the night before, and the day being a surprisingly warm twenty-five degrees, the afternoon was perfect sledding weather. She had to take the children sledding at least once this winter since her son Will was three years old now, and he had never gone before; she had always felt him too little in past years. And she might not have another chance to take him because she was expecting her fourth child; if it were not that bundling up in winter clothes hid what her figure otherwise made apparent, she would not have gone outside at all, but her winter coat would allow her to remain active for another month. Of course, she and Will would have to settle for a safe, small hill, but that was better than an entire winter without a sledding trip. A good half hour was spent getting everyone ready. Will was her only child who needed help putting on his winter clothes, but Mary and Sylvia insisted on their mother’s constant attention even for such little details as color coordinating their hats and scarves. “We’re only going sledding girls, not to a party,” Agnes reminded. “Yes, but you can never be too careful. A young lady must be prepared for every occasion,” Mary replied. Agnes usually ignored such affected comments from her daughters. Mary was the worst while Sylvia only followed her older sister’s example. Agnes thought Sylvia would be more like herself if not so influenced by Mary, who sometimes reminded Agnes a lot of her own stepmother. She often wondered what kind of women her girls would be while she hoped Will would be as kind and handsome as his father. “Are we all ready now?” Agnes asked, after helping Will put on his mittens. But they were delayed another minute. Kathy Bergmann chose that moment to appear on the doorstep with a fruitcake from her mother. “I didn’t expect her to give me anything,” said Agnes, nonetheless touched to be remembered despite Molly’s recent troubles. Except for Montoni’s funeral, Agnes had rarely seen Molly lately. After Agnes’s father and stepmother had moved back East, the Montonis and Whitmans had lost touch with each other. But Agnes knew Molly looked on her as a daughter because her mother and Molly had once been best friends. Agnes had found it hard to visit Molly after she married Montoni because she remembered Molly as a happy young woman, despite poverty and her first husband’s ill health, and Molly’s sadness in recent years had unnerved her into keeping her distance. Now Agnes wished she had done more than just attend Montoni’s funeral and send a gift of money. She should have gone to visit, but Christmas and her pregnancy had kept her occupied. Agnes reminded herself that since her father had moved away, Molly was now the only one left in town who had known her mother well, and Agnes did not want to lose that connection; her memories of her mother were growing dim, and she had recently been surprised to realize she was now several years older than her mother had been when she died. Kathy laughed, and picking up Will, she gave him a big hug. She was sixteen now, and the maternal instinct was strong in her. She yearned for a baby, one as cute as Will, but first she needed a husband. Not even her mother’s second marriage had distorted her romantic notions; Montoni had been a bad man, but Kathy honored the memory of the father she had never known, and she idolized her brother. She even had a secret fondness for Ben, her brother’s attractive business partner; she hoped someday he would notice her. But if not, other men existed who might make good husbands and fathers; she was becoming obsessed with the desire to find one. “Kathy is going to join us,” Agnes told her daughters as they continued to sweat in their winter clothes. “Oh,” Mary said. Sylvia sighed. Both noted Kathy’s unfashionable coat. Seeing that Agnes and Will wanted her to tag along, Kathy overlooked the girls’ lack of enthusiasm and agreed to join the party. Kathy felt self-conscious then, and she hated that Mary, three years her junior, could make her feel that way. “I’ll be warm enough,” she replied. “I have an extra scarf and some heavier mittens you can borrow,” Agnes said. “No, I’m fine. I don’t mind the cold,” said Kathy, already regretting that she had agreed to join them. “Let’s go!” Will screamed and wiggled until Kathy set him down. Then he grabbed her hand and tried to tug her toward the door. “Girls, fetch your sleds out back. We’ll wait out front for you,” said Agnes. A few minutes later, they had walked to the eastern end of Ridge Street, where the bluff sloped down toward the lake to make an excellent hill for sledding. “That’s my grandparents’ house!” said Sylvia as they passed the Hennings’ former home. “They don’t live there anymore,” Agnes replied. Mary looked at Kathy as she spoke, but Kathy ignored the ostentatious child. “Sylvia and I,” said Agnes. “Girls, that’s enough,” Agnes said. “How will she ever find a husband without a decent dress?” Mary asked. “Maybe I don’t need a husband,” said Kathy, denying her dearest longing. “That’s good ’cause rich men don’t like poor girls,” Sylvia replied. “I’m not poor,” said Kathy, “and even if I were, didn’t a prince marry Cinderella?” Despite this bold retaliation, Kathy was unnerved by the girls voicing her fears. “Yeah, but Cinderella was at least beautiful,” said Mary. “No!” cried Will. “Be good. Don’t be bad,” he implored his sisters. “Apologize to Kathy,” said Agnes. Each girl muttered, “I’m sorry.” Kathy tried graciously to accept their apologies, but she felt this much-needed festive excursion was spoiled. They had now reached the top of the sledding hill. Mary gave her mother a funny expression, making it clear she did not want Kathy on her sled, but when Agnes glared back, Mary said nothing. Kathy saw the facial exchange and again wished she had not come, but she would not embarrass Mrs. Whitman by acknowledging her daughters’ rude behavior. “No. Me and Kathy ride,” said Will, unknowingly solving the problem. “Kathy, do you mind going with Will?” asked Agnes. Mary and Sylvia, relieved of Kathy’s company, climbed onto their sled, ready to go downhill. “I don’t mind,” Kathy assured her. Agnes stood at the top of the hill. She watched her girls, then Will and Kathy sail down the snow-covered street. She had looked forward to this outing, but her obstinate girls now made her thankful for a moment alone. She looked out at the lake, slowly freezing over as winter progressed. January was her favorite time of year because the snow completely covered the earth; December even in this northern land occasionally could be without snow, and Christmas was so much trouble—although in the end the children’s pleasure made it worthwhile. But January was a month without the bother of holidays, a month that allowed a good long rest, a month to enjoy the snow before it piled up in February and March and seemed as if it would never end. January was the slow return of longer days, the month when each night a minute or two more daylight remained before you closed the curtains, a minute or two that reflected the promise of spring’s inevitable return. Agnes found pleasure in these little things, in marking the rhythm and progression of the seasons; she never complained about the weather, but marveled over the daily variety as one season changed into another, accumulating into a lifetime of natural wonders. The children were climbing back up the hill, but Agnes still had a couple minutes before they would reach her. She continued to look out at the half frozen, silent lake, so serene this afternoon; a flood of warm sunlight made its iced surface sparkle like diamonds. Some days that massive lake roared like a bellowing monster; some days it was cruel, as when it had taken Caleb and Madeleine. But the lake was a constant in Agnes’s life, something that never failed to revive her spirits when all else came and went. The lake was always there, almost like a family member, someone to quarrel with one day, but ultimately, even if begrudgingly, to love as a familiar extension of herself, its very water flowing inside her. The lake was a part of her as was the snow, the trees, and these hills she loved so well. She felt an especial fondness for this particular spot with its distinct view of the lake. She vividly remembered one summer day when she and her mother had stood on this hill to collect lady’s slippers—they had filled a whole basket with the delicate flowers, and all the while, she remembered that in the distance, through the trees—trees that were now mostly gone and replaced with large prosperous homes—she had been able to see the lake; back then there had been no grand houses, no real streets, just a small collection of wooden buildings nearly hidden along the shore of Lake Superior. At that time, she had known few children to play with, so she had named many of the trees, pretending they were her friends as much as any little boy or girl in the village. In later years, her father had frequently told her how her mother had loved this land—she wondered whether her mother had also thought of the land as a friend, a real person, a very part of her soul. Agnes loved her hometown, but she liked to remember more what it had looked like nearly thirty years ago when she was a small girl. Everything had changed since that distant spring day when she had come here to pick flowers with her mother, yet for a moment she could forget it was winter and that she stood in the middle of a fashionable neighborhood; for a moment, she could imagine it was spring in the forest and her mother was with her, listening to her childish prattle. She awoke from the past and turned to her son. “Was it fun, Will?” she asked as he ran up to her, his chubby cheeks glowing red from the cold. “I wanna go again!” he screeched with delight. “You don’t have to take him if you don’t want to,” Agnes told Kathy. “I don’t mind,” Kathy said. “Just don’t scare him by going too fast,” Agnes replied. She watched Kathy and Will go downhill again. Then Mary and Sylvia arrived at the top for their next trip down. Agnes perched herself on a low snowbank, simply content to exist in this beautiful place where her mother had once watched her as she now watched her children. When Will came back, he wanted her to ride with him, so she and Kathy started taking turns going downhill until Will’s little legs became exhausted from climbing back up. Agnes hoped that meant he would take a nap when they got home. Finally, she and Kathy sat on a hard crunchy snowbank while Will curled up in his mother’s lap and fell asleep. She wrapped him in her scarf to keep him warm. She considered taking him home, but the afternoon sun was causing icicles to drip off nearby houses, so she thought it warm enough to let the girls sled down the hill a few more times. Since Kathy waited with her, Agnes asked after Molly. “Mama’s fine,” said Kathy, not wanting to confess how her mother had moped since the funeral. “Not at her age,” said Kathy. “That’s not so old,” said Agnes. Kathy regretted the words as soon as they were spoken, not wanting to shame her family. “I don’t think I’ll ever get married,” Kathy said. “No, I don’t think I want to,” she lied to deny her fear of being a spinster. “You will when the right man comes along,” said Agnes. Kathy thought it easy for Agnes to say such things when she had a husband and did not have to spend every day wondering whether she were destined for spinsterhood. “We can lay Will in the sled to pull him home,” said Kathy. “Oh no, she won’t be worried,” said Kathy. “Thank you for inviting me.” She did not add that she had not enjoyed herself. “Yes, it is pretty,” said Kathy, but she was too worried about her future to appreciate the present moment’s glory. Agnes asked Kathy to come home for a cup of hot chocolate, but Kathy excused herself to turn down Front Street and walk south to her mother’s house. She said she should get home before dark, but truthfully, she did not want to be around Mary and Sylvia any longer. She liked Agnes, but she had not found her comments on love very reassuring. She was terribly lonely, yet she preferred to be alone with her yearnings than to feel a lack of connection while speaking to others. She wanted to be needed, especially by a man, but everyone she knew already seemed to have a full life and not need her. Except for her mother, whose need scared her. After we finally had our first winter storm this week, I thought I would post one of my favorite passages from my novel Superior Heritage. This scene takes place after a blizzard keeps John and Chad Vandelaare, in their early teens, home from school for the day. The boys go out into the storm as it is dying down with their dog named Dickens. Being cooped up in the house all day made John and Chad anxious to explore the newly created landscape left by the blowing wind and drifting snow. Ellen was hesitant to let them go outside, but after supper, when the visibility had increased until individual snowflakes could be distinguished as they fell, she finally consented. It would not be dark for another hour, so the boys had plenty of time to trudge over the snowbanks and burn off their excess energy. John and Chad put on their long johns and flannel shirts, then their snow pants and jackets. They wrapped scarves around their necks, pulled hats down over their ears, and slipped on boots and mittens. Before they went out the door, they were already starting to sweat from wearing so many layers, but they would be well protected once outside. John suggested Dickens should join them since he must be equally tired of staying inside. During the day Dickens had only made quick bathroom trips into the driveway, just a few feet from the garage door, but now he could wander free until he complained of cold feet. Soon the boys and Dickens were outside. They quickly discovered the wind was still strong, so seeking protection, they set Dickens up on the high snowbank, then climbed up themselves. They trudged on top of the snow, at times six feet above the buried grass, until they reached the shelter of the neighboring woods. They found a giant pine tree whose lowest branches, usually eight feet above the ground, were now heavily weighed down with snow, until they curved down three feet to touch the top of the frozen banks. The boys were forced to bend down to enter beneath the tree whose branches were too high for them to reach on summer days. Beneath the tree’s bent limbs, they felt sheltered in their own little lodge house. A small depression around the tree formed snow walls to provide further insulation from the bitter chill wind, while leaving room for John, Chad, and Dickens to sit and watch the dying storm. Exhausted from the heavy trudge into the woods, the boys and Dickens were content to listen to the storm’s fury. The dazzling whiteness of everything was breathtaking—snow was clustered against the brown and gray tree trunks, turning them into giant white poles, while tree branches had glazed over with frozen ice and snow that perched precariously until the morning sun would come to melt it away. Neither brother was eloquent enough to express his awe over the beauty of the scene, but neither could fail to notice it. Now free from the stifling, still air inside the house, the boys gratefully opened their mouths and breathed in the fresh coolness, enjoying the pleasure of it biting down their throats. They pulled off their gloves to coil their fingers into fists, then replaced their gloves with their fingers curled together to ward off the numbness a short while longer. They took turns petting Dickens with their fisted gloves, while Dickens huddled against them to stay warm. Serenity filled the moment, yet in this serenity was an exhilaration surpassing yesterday’s anticipation of the storm. As the wind slowly died down with less frequent gusts, the boys felt proud to have survived the storm. Nature’s fury had left behind three feet of snow, broken tree branches, enormous snow drifts, hundreds of hours of snow removal work, and downed power lines, but it had also revived the courage of its witnesses; they were survivors like their pioneer ancestors who had fought similar storms a century before when snowblowers and electricity had not been imagined; the pioneers’ survivor spirit had resurrected itself, making the Vandelaare boys respectful admirers of Nature’s sublime power. John’s spirits had been especially stirred by the wind, now no longer a screeching banshee voice wreaking havoc, but a simple whisper carrying the last twinkling fall of snowflakes that resembled confetti more than ice bullets. John recalled the Bible story of God’s appearance to the prophet Elijah. There had been a wind, an earthquake, and a fire, but God had not been in any of them. God had been found in a gentle whisper. Now John felt he understood that passage. The wind had subsided to a whisper, a promise of peace and renewal as the snow cleansed the earth to create a new landscape. John felt a deepened sense of contentment, as if he had learned a secret about Nature’s incredible power, yet sheltered beneath the pine tree, he felt he would always be safe in the northern wilderness, no matter how fierce the blizzards might blow. The boys and their dog trudged back out of the woods. Where before the storm had caused a blinding greyness, now a tiny pink streak in the Western sky promised a fine day tomorrow. 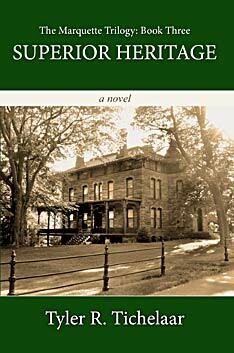 Ellen had seen her sons heading toward the house, so she had water boiling on the stove for hot chocolate when they came inside. She told them to change their clothes before they thawed out and were wet. Then, with the storm all but forgotten, the family sat down to drink hot chocolate and play Monopoly until bedtime. But in later years, when John would live in a far away city where fierce Northern winters were unknown, the memory of that storm would come back to him. A strong wind would recall the powerful snowfilled gusts of his childhood, and he would imagine himself once more at home, hearing the wind wailing down the chimney, or sitting beneath a pine tree’s branches to watch Nature’s sublime fury. Then he would realize how impressionable he had been to his native land’s natural rhythms where he had formed a bond with the wind, the trees, the snow, Lake Superior, and the seemingly neverending Hiawatha forest that encompassed his childhood world. Wherever he went, John was branded with the knowledge that he belonged to this place; whatever majestic sights he saw, the serenity of a snowfall surpassed them all. You are currently browsing the MY MARQUETTE weblog archives for January 2012.